The Sweetheart orchid lei is sewn similar to a “Butterfly,” but woven with over 180 dendrobium petals loosely braided to display more of the orchid’s splendor. 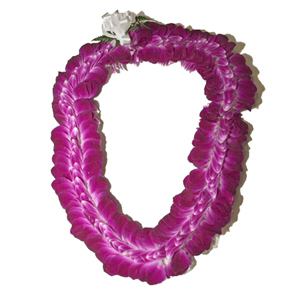 This spectacular lei boasts brilliant color and lays flat on the shoulders and neckline. The sweetheart lei is perfect for your “sweetheart” and is a popular lei to give for anniversaries, Valentine’s Day, or birthdays. Care: Refrigerate in a sealed plastic bag or container.